Introducing Training Plans – Zombies, Run! Hundreds of thousands of runners got started with our Zombies, Run! 5k Training, which uses an 8-week programme to take anyone from their couch to running a 5k. With our new Training Plans feature, we’re bringing the same structure and weekly progress to the main Zombies, Run! app. 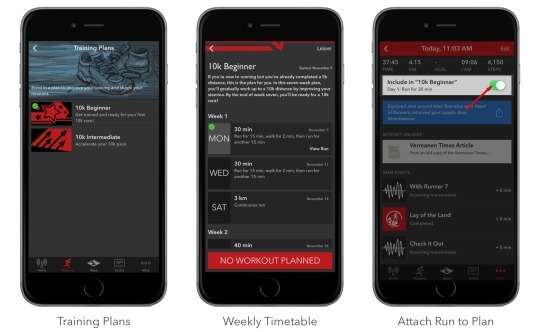 Training Plans are included in the new 4.3 update on iOS, and are free for all runners! Once you enrol in a Training Plan, you’ll be given a weekly schedule of runs. After completing a qualifying run (by meeting its time or distance requirement), you can tap a switch which marks it as complete in your Training Plan schedule. We’ve included two plans to begin with: 10k Beginner and 10k Intermediate. These are 7-8 week plans intended for those who can already run a solid 5k and want to train further. Training Plans are included in the Zombies, Run! 4.3 update for iOS, available now through the App Store! We’ll be introducing more Training Plans in the near future, and Training Plans will be coming to Android later this year. Let us know what you think!